Despite the overwhelming importance of the Chinese economy to the success of Western economies, there has yet to be an examination of why Western companies have had difficulties in doing business with the Chinese. A significant barrier that companies have difficulty to overcome is the effective communication with their Chinese counter parts. This major impediment is caused by no understanding of the cultural differences between the Chinese and Western business cultures. This book offers the solution to this problem: the bi-cultural personnel. 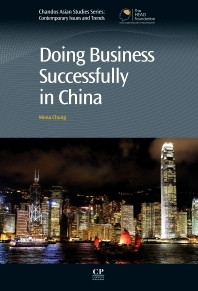 Dr Mona Chung is an expert in doing business with China. As a bi-cultural person she short-circuits processes and produce results that increase efficiency by between 70% and 50%. Dr Chung is a frequent guest speaker at public forums and tertiary institutions and is the author of an extensive list of publications in cross-cultural business studies. Dr Chung teaches international business, management and marketing.